Battery life, however, remains a mystery. 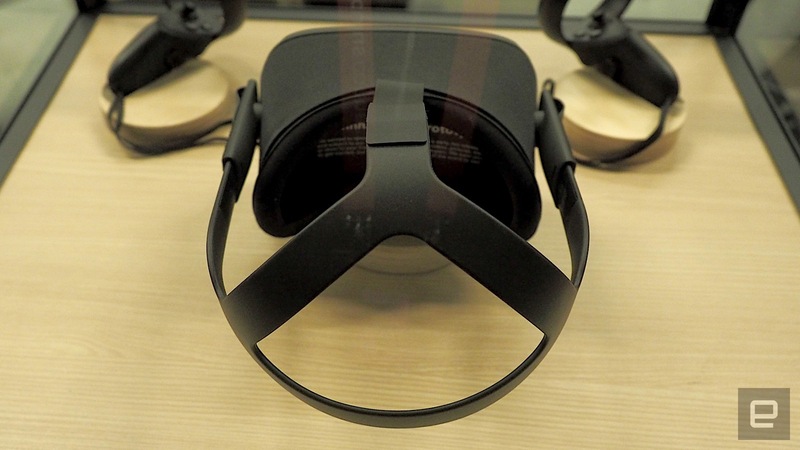 Hugo Barra, Oculus' head of VR, said earlier this year that the standalone headset is the key to mass adoption of VR. And in 2018, the company is doubling down on that claim. A few months ago, Oculus released its first standalone headset, the Oculus Go, an affordable phone-free alternative to Samsung's Gear VR. Today, at Oculus Connect 5, the company unveiled the Oculus Quest, which promises Rift-like experiences, but without a PC. In my brief experience with it, the Quest lives up to the standalone VR promise, though it doesn't quite match up to the quality of the Rift. At least not yet. 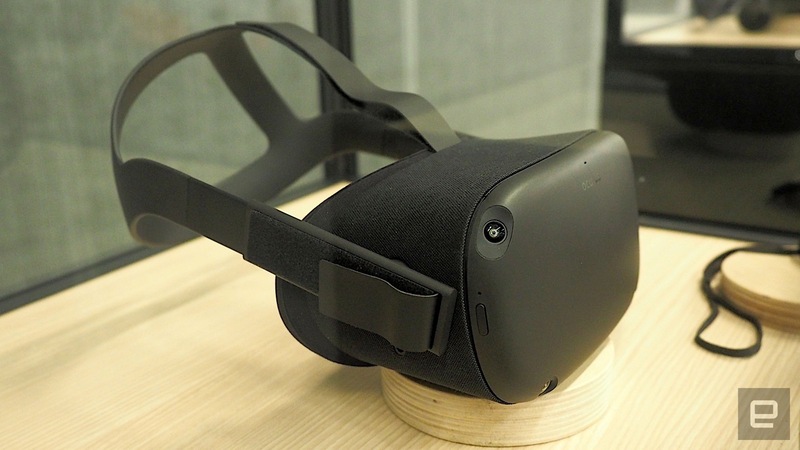 What sets the Quest apart from the Go as well as the Rift, is that it is the first-ever headset to carry Oculus Insight, a technology that powers the device's "inside-out" tracking capabilities. It uses the four ultra wide-angle sensors located on the front of the headset as well as computer vision algorithms to help track your position in real-time. This gives the Quest six degrees-of-freedom without the need for external sensors. The Go, on the other hand, only has three DoF, while the Rift needs several external sensors in order to have the same head-tracking capabilities. Insight has been under development for over two years, and back then it was referred to as Project Santa Cruz (Andrew Bosworth, Facebook's VP of AR/VR, says Santa Cruz is more a name for the technology, rather than the headset, but admits that it's a bit of a naming nitpick). When I first tried on an early version in 2016, it was mostly a hodgepodge of circuits and wires. Last year, however, the product looked and felt much closer to production-quality, and feels very similar to the Quest hardware I tried on today. I used the Quest with three different VR experiences: Superhot VR, Dead and Buried in a team environment, and Project Tennis Scramble, which was made especially for the conference. The mesh fabric on the front of the Quest is very similar to the feel of the one on the original Rift, and the straps on the side and top of the head feel similar as well. There's an elastomer head brace on the back, which is a little more rigid on the Quest than it is on the Rift, but is not at all uncomfortable. In fact, I found it to be one of the most comfortable VR headsets I've ever put on. The Touch controllers for the Quest look very similar to the Rift's, but are not quite the same. 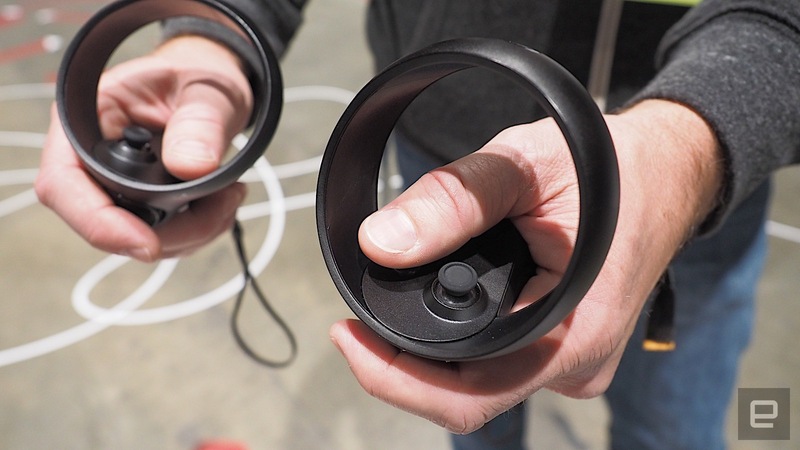 While the circle sensors on the Rift's Touch controllers curve towards the bottom, the ones on the Quest controllers curve towards the top, which look a little similar to the HTC Vive's wands. Either way, I found the controls to be pretty identical to that of the Rift; there's a joystick, X and Y buttons, an Oculus home button, as well as trigger and grip buttons. One interesting difference between this and the Rift is that it does not come with built-in headphones. Instead, like the Oculus Go, the Quest utilizes spatial audio to direct sound into your ears. You have the option of using your own headphones of course, but as I was walking around punching enemies and shooting bad guys, I didn't think they were necessary. I could hear everything around me just fine. In fact, I felt a lot better without headphones, because I felt like keeping my ears open would make me more alert of my surroundings. After all, there are no more wires to keep you tethered to a PC, so some safety precautions are probably wise. Speaking of safety precautions, I have to admit that walking around in an empty space without seeing what's around me felt a little dangerous. I kept wanting to take my headset off to make sure I wasn't bumping into a wall. Oculus did incorporate its Guardian tech into the Quest, which lets you put up virtual boundaries to prevent such incidents, but it still felt a little like walking a tightrope without a net. Oculus must have foreseen this, because with Dead and Buried, there's actually a mixed reality option that lets you see the real world around you, albeit in a cartoony drawn style. 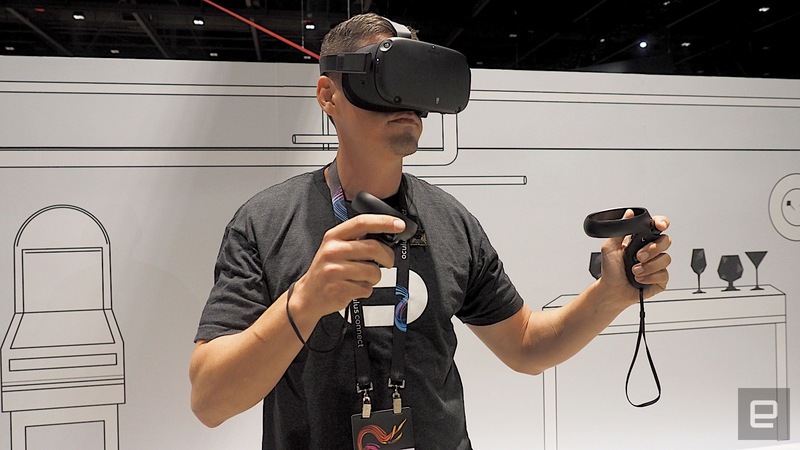 This way, Oculus says, you don't have to lift your headset to know what's going on around you, and can avoid bumping into your teammates as you're running around dodging bullets. I found that I didn't really need this mixed reality mode most of the time -- the VR mode worked just fine for the most part -- but I liked having it there just in case. I also noted that playing certain games was actually a lot easier in confined spaces, compared to big ones. In the tennis game, for example, there was an option to play it in either a small living room environment, or a larger tennis court-style environment. In the tennis court room, I had to really lunge and run to make my shots. My opponent, which happened to be Bosworth, was in the smaller room, and didn't have to be quite so athletic. He ended up beating me easily, and I think that might be the reason. Or that's my excuse anyway. On the whole, I did feel that the experience was very similar to using a Rift, with the ability to look around corners and behind objects. Gameplay was a lot of fun, and it was great being able to walk around without wires holding me back. It definitely made the experiences a lot more immersive. Yet, it doesn't quite match up to the Rift experience, at least graphics-wise. Yes, the Quest has 1,600 by 1,440 resolution in each eye and that offers crisp and colorful images, but the shaders in the art are just not as sharp and detailed as on the Rift, which of course has the benefit of the sheer power and performance of a beefy PC GPU. "There's a real limitation of watts you can put on someone's head," said Bosworth. Not just in terms of performance, but also from a thermal perspective. "There's no real way to dissipate all of that heat, especially in a wireless product." Another big question I had was battery life. Unfortunately, Bosworth was unable to tell me just how long it lasts. During my demo of Dead and Buried, I noticed that the Oculus team kept swapping out headsets and charging them in between sessions, which makes me think that the battery life is probably not very long. It might all be worth it though, at least according to Bosworth. "You get the same experience as the Rift, of being teleported into space," he said. He added that while you can't download all Rift games onto the Quest, it should be pretty easy for developers to port their existing Rift titles to Quest. Over 50 titles are set to launch with Quest already. As for the future, Bosworth is looking at more than just VR. "Now that we have the first generation of VR headsets completed, we can start looking at mixed reality," he said. "We could blend virtual and real environments, and move into areas beyond entertainment and games." Mixed reality, he said, would be much more useful for everyday life, like using an infinite digital workspace for example. It's certainly a concept we've heard before from the likes of Microsoft and Magic Leap. "The future is not just gaming and content [...] We need to make this tool more useful, to open up more markets," he said. "We have to look beyond the immediate applications of VR, and what else it could become." In the meantime however, VR is still mostly about immersive games and experiences. To get a Quest of your own, you'll have to cough up at least $400 for the 64GB version. The earliest it'll be available is the spring of 2019.